When late August folds itself into September, peppers begin to arrive in our CSA box. A beautiful assortment of both common and obscure peppers appear, and in abundance far greater than we can eat up in one week alone. There’s the long and gnarled red Jimmy Nardello sweet pepper. The screaming hot Thai bird chilies. The squat pimientos. The brilliantly colored Scotch Bonnets. And bell peppers, serranos, and jalapenos all mixed together in big baskets. I pluck out the bright green peperoncini, and separate them from the rest. These I like to pickle through fermentation, heightening their flavor. I serve them with home-cured olives throughout the winter, as appetizers. 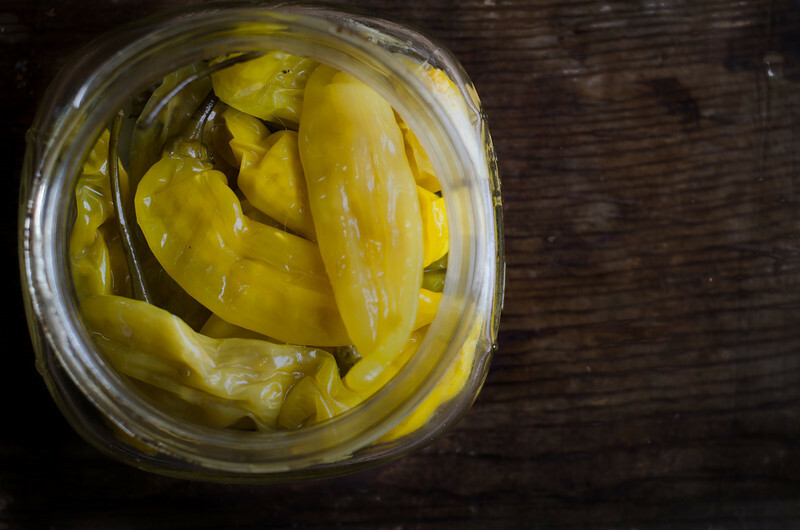 When hot peppers appear in abundance in late summer, and they always do, there’s many ways you can preserve them. I tend to favor drying the peppers or fermenting the peppers, as both methods use very little energy and take minimal effort in the kitchen. I dry many of them in my dehydrator, and then grind them into hot chili flakes using a spice grinder. We season our foods with the dried chili flakes all winter long, just as we’d use black pepper. I puree the peppers and ferment them in classic salsas like this Raw and Fermented Tomatillo Salsa. I make Fermented Hot Chili Sauce from the red jalapenos and brilliantly colored Scotch Bonnets. I pickle jalapenos and peperoncini whole using the method below. I use two primary methods in preparing fermented vegetables: shredding the vegetables, or pickling them in a simple brine. I like the charm and appearance of a whole jalapeno or whole peperoncini pepper served in a dish of antipasto, so I typically ferment hot peppers much in the same way I’d ferment true sour pickles: in a saltwater brine, seasoned with garlic, herbs and spices. Fermentation is a beautiful process whereby you create an environment that promotes the growth and proliferation of beneficial bacteria, either wild varieties that exist in the environment of your home, or those introduced in a starter culture (like this one). With time, the beneficial bacteria eat away the carbohydrates in a food, and transform them into various acids, giving fermented foods their characteristic flavor. Get Cultured! An online cooking class with 50+ videos devoted to *ALL* things fermented and cultured. There’s three sections on culturing dairy, including yogurts, kefir, clabber, butter and more. Check it out here. The Art of Fermentation. A comprehensive book on fermentation in history and the fermentation movement as a whole, with a great deal of information on yogurts and other cultured dairy products. Check it out here. Real Food Fermentation. 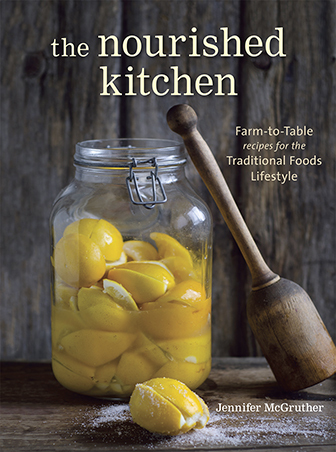 A great introductory book with large, vivid, step-by-step photographs illustrating how to prepare many fermented foods like sauerkraut, pickles, relishes and more. Check it out here. Pour the water into a medium-sized sauce pan and warm over medium-low heat until it reaches about 100 F. Sprinkle in the salt, and whisk it into the hot water until it dissolves. Pour the warm saltwater into a pitcher, and let it cool to room temperature. Whisk in the starter culture, if using. Pack a quart-sized fermentation jar (like this or like these) with whole peperoncini, taking care not bruise them. Place the garlic cloves and bay leaf among the peperoncini, and pour in the cooled saltwater brine. Seal the crock, and allow the peppers to ferment for 10 days. Their color will fade and yellow. After about 10 days, open the crock and try a pepper. If you prefer a sourer flavor, continue fermenting the peppers until they acquire the flavor you like, testing every 5 to 7 days, at your leisure. Transfer to the refrigerator or cold storage. Brine-pickled peperoncini will last about 1 year, properly fermented. Using a starter culture. Starter cultures (like these) help to ensure that specific strains of beneficial bacteria become established in the fermented foods you prepare at home. While successful fermentation occurs with or without them, those who consume fermented foods as part of a therapeutic diet may see benefit from cultivating specific strains of beneficial bacteria. Others, who are new to fermentation, may feel more comfortable using a starter culture until their knowledge of and experience with preparing fermented foods grows enough to give them confidence in trying wild-fermented vegetables. THANK YOU. We love peperoncini on sandwiches but, except for one brand (which is hard to find), I am unable to find them without sodium benzoate and yellow food coloring. Uggghhh..why do they need yellow food coloring? Now, I will make my own. I am so excited! I know! Why on earth do they need to add food coloring! They’re colorful enough. I hope you like these. What you have in the Jar . Caned Some 2 years ago. Turned out great . Planted 8 pepericnii this year out to have plenty ! My question is could you do this recipe with whey instead of a culture? Yes, but I don’t see a lot of benefit to using whey as a starter culture. If it were between whey and wild fermentation, I’d go wild fermentation – salt only. I don’t have a facebook account, so I’m asking my fermentation question here … I’m trying beets for the first time. I used 1 tablespoon salt and enough water to cover the beets in my glass quart jars. There were several bits of the beets that weren’t covered with the water and got moldy. The juice is thick and syrup-y, but doesn’t smell bad, mostly like the regular canned pickled beets (at this point anyway.) Is this normal? Safe? How can I tell if the beets have not fermented properly? They have been sitting for about 6 days. Question: I used kosher salt for my ferment – is it necessary to use sea salt, or does it provide an additional benefit? The type of salt doesnt matter as long as its pure. The biggest problem with salt is if they contain anti caking additives. This will turn into a weird looking goo during pickling. I use canning salt because it doesnt contain the anti caking additive or anything else. It is also fine so it dissolves easily and it is cheap. I bought 4 quarts of “sweet Italian peppers” just for this purpose. Now that I have seen yours I am so impatient! They need to hurry up and ferment. Looks divine. can you make these without the salt? Salt is critical to the fermentation process. So glad I saw this recipe today! It will be the first one of yours I try, once I can get the culture & figure out where to find the peppers! I LOVE these and wondered if I’d ever be able to get a better option than what’s in the stores. Thanks! I am so excited to try this recipe and have a TON of pepperchinis to do! I don’t have actual fermenting crocks or jars. Would mason jars with weights work? Thanks for the lovely recipe! I tried this recipe but used a mason jar cause it was what i had. I screwed the lid on finger tight and set it aside. after a couple of days the peppers began to float and the ones at the top are darker then the ones in the brine. I opened up the jar and the ones out of the brine are dark is this a problem and can it be fixed? I recommend investing in a fermenting crock. The dark ones are just oxidized a bit, and as long as they’re not off-smelling, or slimy in texture or moldy, they should be okay. You can also find weights can be helpful in preventing floaters. Thank you for the wonderful information! I noticed your water filter and just wanted to know if you know what the pH is of the water you use to ferment with. I have the ability to choose a pH level and am confused as to whether I should go with an acidic or alkaline water? I hope that doesn’t sound too crazy. The fermentation jars you show have the rubber seal and top that clamps down. When you ferment in that does the gas escape or do you have to burp the jar occasionally? Made these last weekend, so waiting for them to ferment now. Noticed yesterday that there’s strange white stuff floating around inside the jar… bad sign? That sounds like Kahm yeast which is harmless, but can leave your ferment with a weird flavor if you don’t remove it. What are weights made of? And where can you buy them? Thank you for this recipe. I just started seven jars of hot Hungarian peppers with it and began to wonder if air might be trapped inside the peppers and if that might cause problems. Wow these are my favourite peppers to include in everything. Now I can make them on my own and feel better about eating them. It may be December 1 but I am already thinking about my summer garden and all the good things I can create. This is on my list. 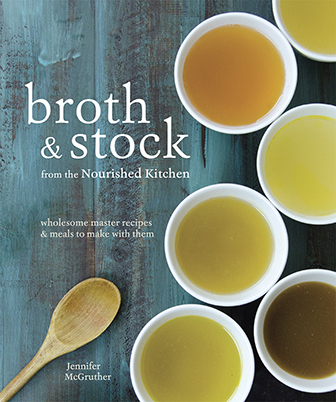 And your cookbook is on my Christmas wish list. A couple days into fermentation following this recipe and the peppers are bubbling well! I see some recipes calling for piercing the peppers to allow the oxygen out and the brine in. Is this necessary? thanks! Starting to look around the garden to see what else to ferment…tomatillo salsa verde will be next! ???? Should I pierce the peppers before brining them? I regularly ferment sauerkraut, using just salt in a five gallon bucket. I am quart jar I start with just salt, but add back brine to keep the liquid level above the veg. I also use weights to keep things submerged. I have a pile of small end-of-season Hungarian wax peppers that are going into jars. I fermented kale stems in a salt brine this year- I hate throwing them away. Not my favorite pickle, but something to chop and toss into a salad.